Sometimes the cold weather can act as a wardrobe deterrent. So what's a fashonista to do? Below are some trends that might make the frosty air just a tad more bearable this season. Don a fur vest this season. Outrageous? Think again. Don't worry about PETA activists throwing red paint on you. Just opt for faux fur instead. Most people are hesitant to don anything fur-related, for fear of giving off an air of pretension. Fret no more. Depending on the length of the coat, fur vests can be worn casually or dressed up. While shorter ones are more casual, longer ones can be paired with a dress or skirt for a more styled look. This is where personal preference comes into play. Fur vests add a touch of sophistication and luxe to any outfit, without making you look like a yeti or wolly mammoth. Cozy, chic and animal-friendly. What more could a girl ask for? If fur isn't the way to go, then turn to shearling for an equally warm option. Being spotted on runways from Burberry Prorsum to L.A.M.B. is proof enough that this aviator-style jacket is an essential outerwear for braving the cold this season. It can be worn with anything from jeans to dresses. Plus, it adds that touch of edginess to your outfit. Forget about that last-season parka. Go for shearling instead. The best thing about this time of the year is cozying up with a thick sweater. The whole jeans and sweater combo is getting rather tedious, so why not change it up a bit? Wear an oversized sweater over your favourite dress. But remember to dress according to proportions. A slim-fitting or flowy dress is perfect with an oversized sweater, while a more fitted one is best reserved for a voluminous skirt. To prepare for the chilly season, searching out the perfect coat is a prerequisite to guarantee both warmth and style. 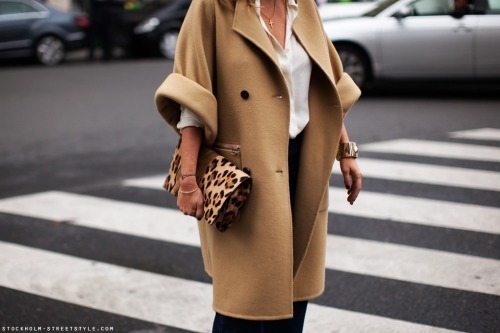 Instead of resorting to a classic peacoat, why not try your hand at a cocoon coat or winter cape?